It is a program that is supposed to represent the cream of the crop in worksites – those that have “exemplary safety and health programs.” But a new report from the Government Accountability Office suggests OSHA’s lack of internal controls for its Voluntary Protection Programs may be allowing unqualified worksites to participate. 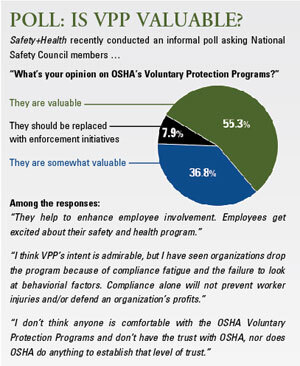 More than 2,200 worksites participate in VPP, covering more than 800,000 workers, according to OSHA. VPP sites are exempt from routine inspections, but are subject to inspections following deaths and serious injuries. In the report, released June 18, GAO analyzed data on VPP participation from the program’s 1982 inception through 2008 and found OSHA lacks policies to ensure regional offices document follow-up responses to incidents at VPP sites. In a review of files for the 30 VPP sites with fatalities from 2003 to 2008, GAO found no documentation of actions taken by a region’s VPP staff. Specifically, GAO pointed out one site with a fatality that had 10 violations related to death, including seven serious violations, but was allowed to remain a VPP Star site – the highest rating in the program. Further hampering the program is that OSHA has no review process to ensure regional offices are consistently complying with VPP policies when monitoring a site’s injury and illness rates or conducting onsite reviews, according to GAO. In nearly 80 percent of the cases reviewed, the regional offices failed to obtain written approval from the national office to review a site’s medical records, as required in the “VPP Policies and Procedures Manual,” an instructional document for administering the program. As a result, regions did not have access to workers’ medical records to verify a site’s injury and illness rates. GAO also found that OSHA has no goals or measures by which to assess VPP’s performance, and said the agency’s efforts to evaluate the program’s effectiveness were inadequate. OSHA contended that VPP participants’ average injury and illness rates, which are 50 percent below the industry average, is a good measure. But this measure “may not be the best” because of aforementioned discrepancies GAO found in the rates. Develop a documentation policy for follow-up actions taken by regional offices in response to death or serious injury at VPP sites. Establish internal controls to ensure regions consistently comply with policies for conducting onsite reviews and monitoring injury and illness rates. Develop specific goals and measures to establish a system for monitoring VPP performance. In response to the report, OSHA announced in a press release it would conduct a “comprehensive evaluation” of both VPP and its Alliance Program. “Our evaluation of these programs in the context of OSHA’s limited resources will help ensure that OSHA will be able to reprioritize these resources in the most effective manner,” acting OSHA administrator Jordan Barab said in the release. This statement reinforces comments Barab made April 30 before the House Work­force Protections Sub­com­mittee. In his testimony, Barab suggested OSHA would redirect additional resources away from VPP. His remarks initially triggered alarm among VPP advocates; however, the Voluntary Protection Programs Participants’ Assoc­iation issued a press release saying Barab told VPPPA Executive Director R. Davis Layne that OSHA is not suspending the program. VPPPA, a Falls Church, VA-based nonprofit organization made up of current and aspiring VPP sites, also supported GAO’s recommendations. Although Barab said in testimony that OSHA needed to better use existing resources, VPPPA asserted that additional funding for the program would address GAO’s concerns.